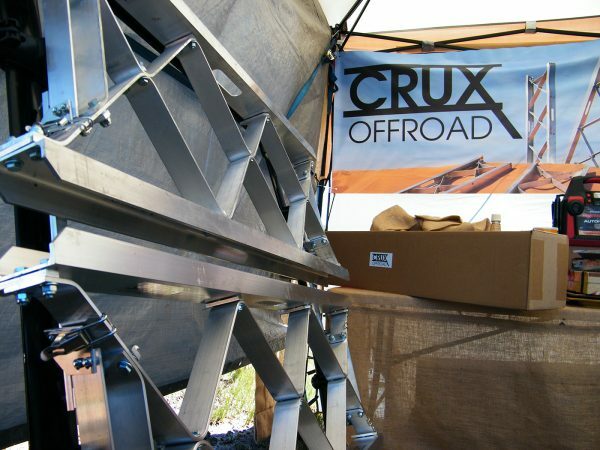 This is our second installment on Overland Expo covering products. Besides the classes and workshops, there’s a whole section of the Expo devoted to vendors. What follows are some of the more interesting ones that Greg, our man on the scene, spotted. The photo above shows a collection of handmade fire steels by L. T. Wright. 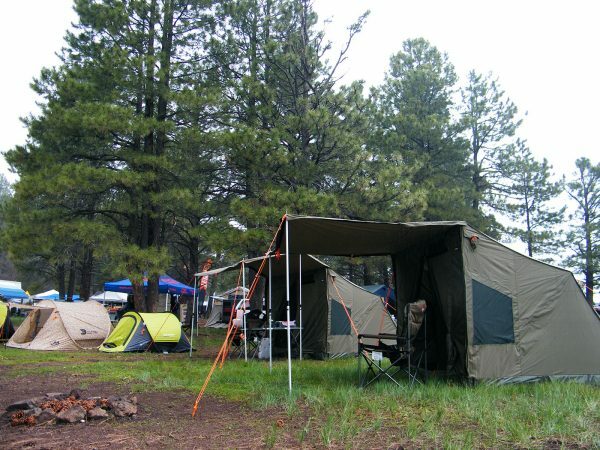 Next year’s Overland Expo will be held May 20–22, 2016 in Flagstaff, Arizona. 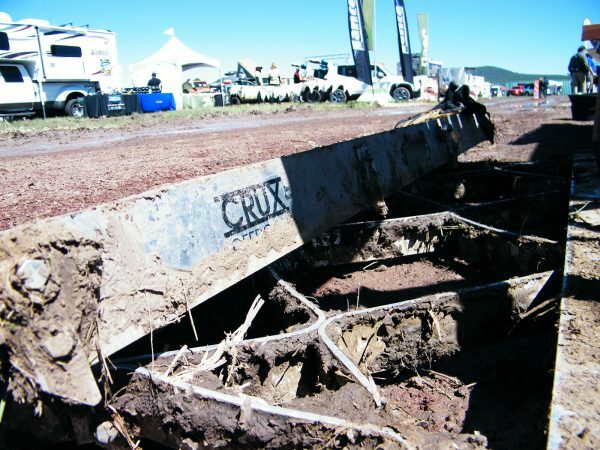 The event offers a chance to work on your overland driving skills, attend workshops and classes, watch films and demos, and offers a tangible air of camaraderie. They’re already taking reservations. If you’re interested, click here. 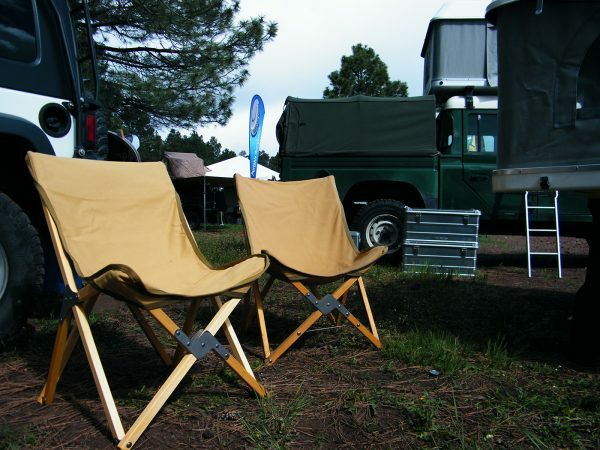 American Camp Chair utilizes leftover wood from the piano manufacturing industry to create high-quality camp chairs from a classic, 19th-century design. 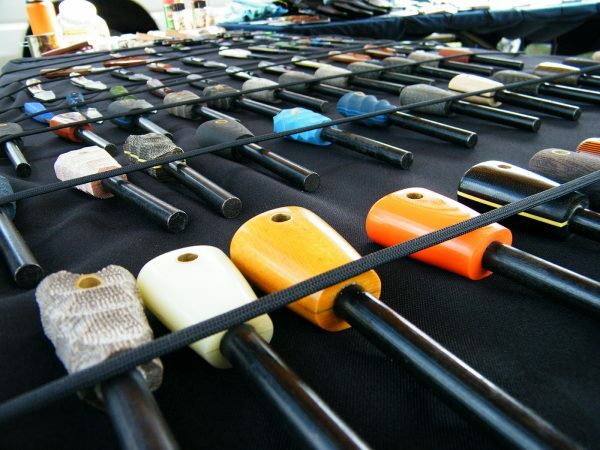 The sling is made of high-quality duck canvas. Chairs cost about $240, but that price still represents a low profit margin for the company, since much of that cost goes into the quality of the chair. 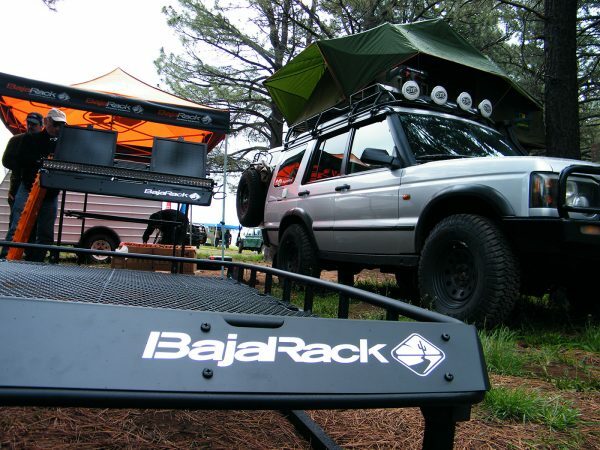 A roof rack from BajaRack. 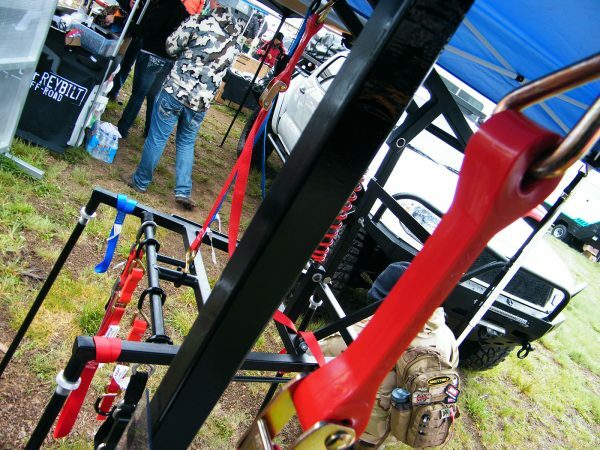 Their Mule rack is powder-coated, universal fit rack for trucks with existing factory cross bars. This is nice, if you have something like a Montero for which there’s not a lot of after market support. A 48″ x 64″ Mega Mule rack is only $450. Not bad! 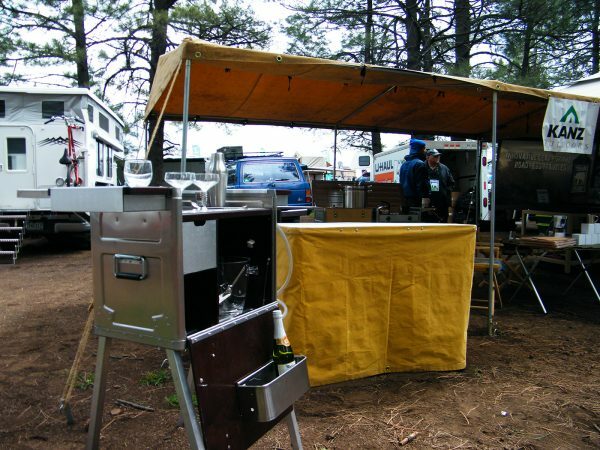 This is a German-made Kanz outdoor bar, for when you want to take your high-country cocktail hour up a notch (or two). 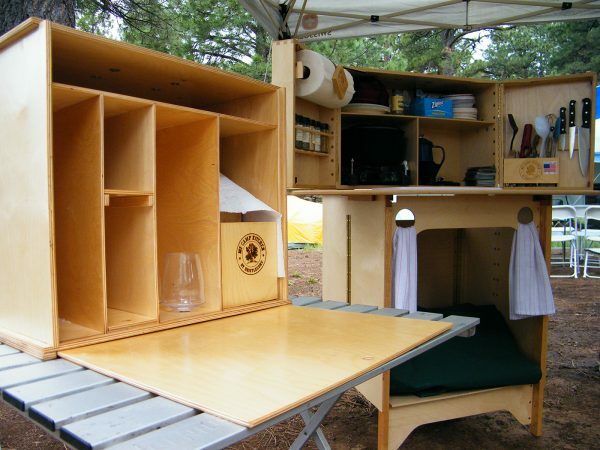 These are modular camp kitchen and chuck boxes by My Camp Kitchen. Again, high-quality stuff here: hardwoods, nice joinery, brass hardware. I bet these would make trail cooking a real pleasure. The tent above is an Oz Tent RV-5Oz Tent. It offers 72 sq. 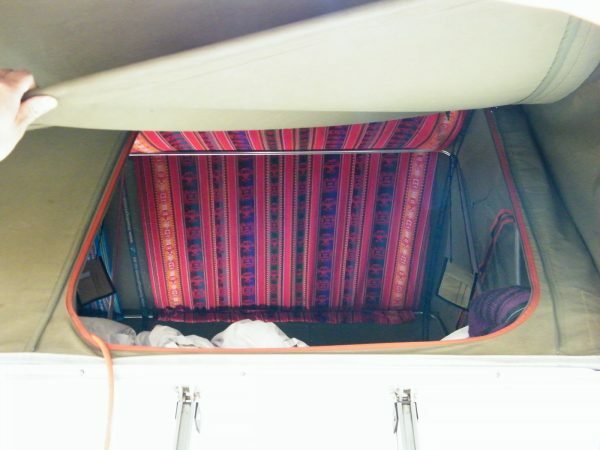 ft. of space, over 6 feet of head room, a large awning (whose space can be enclosed by optional panels), heavy-duty construction, and a very fast set-up time (about 30 seconds to set up the tent and a couple of minutes to stake it down.) Heres a video. Apparently it’s an Australian classic but it will set you back over $1000. These tents are from Oz’s Malamoo line. They’ll set you back only $200 to $350 depending on size, and practically set themselves up. Here’s a video of that. 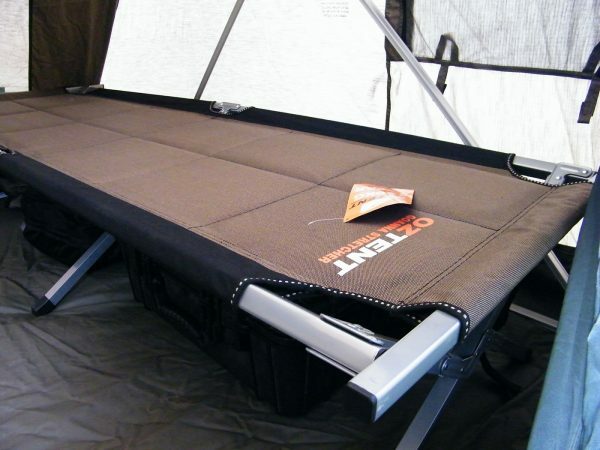 Oz Tent also makes very nice cots. 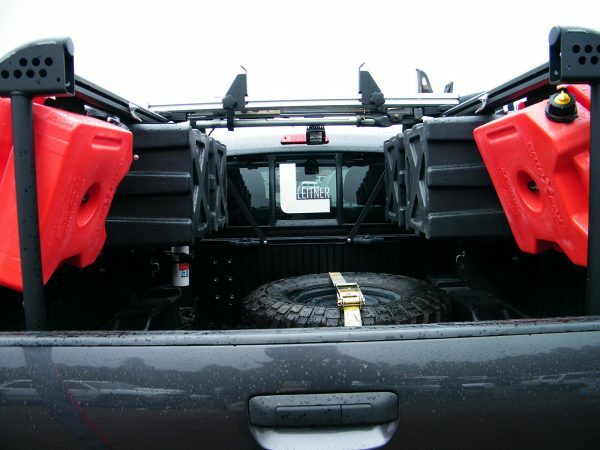 These Roto Pax storage cubbies and fuel tanks are designed to free up space in the bed of your truck. If you use ratchet straps you’ve probably noticed that they can vibrate loose under load. These Shock Straps are designed to prevent that by building in a flexible link along with the ratchet strap. They’re also much beefier than the standard ratchet strap. 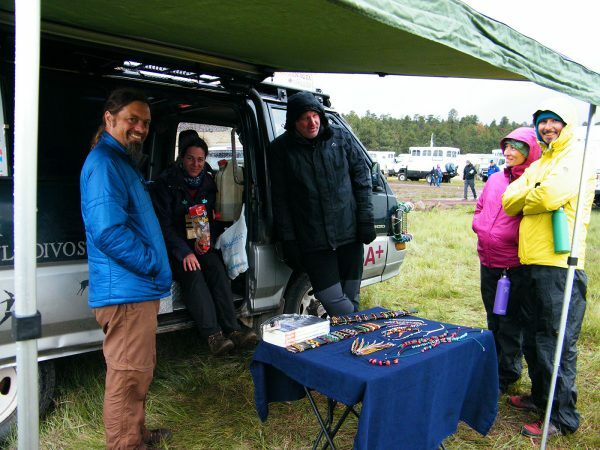 There were also handmade goods from overlands like Pablo and Anna who have been driving their Mitsubishi Delica, La Cucaracha, around the world for the past ten years. 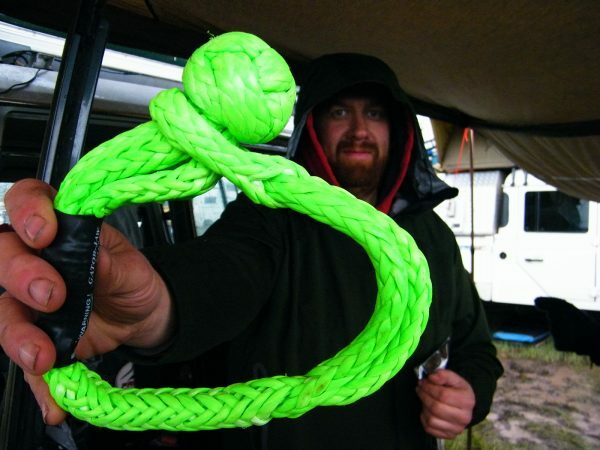 This simple looking loop of rope is actually a very clever shackle replacement. 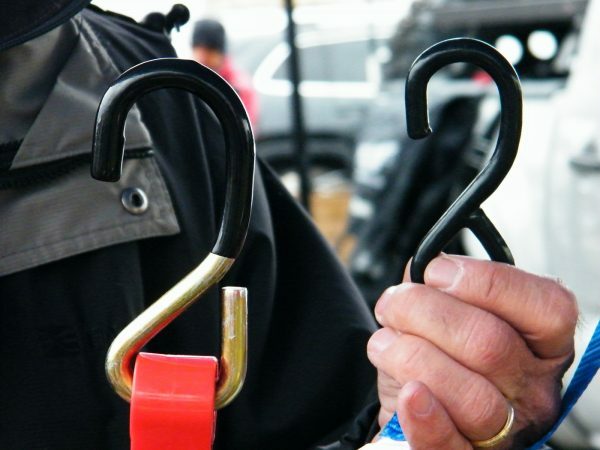 It’s called Gator Jaw and it’s a “soft shackle” that can replace a standard D-ring shackle or be used to attach to a truck where no good recovery point is available, around a bumper or frame for example. It’s rated to 32,000 lbs. and costs just over $40. 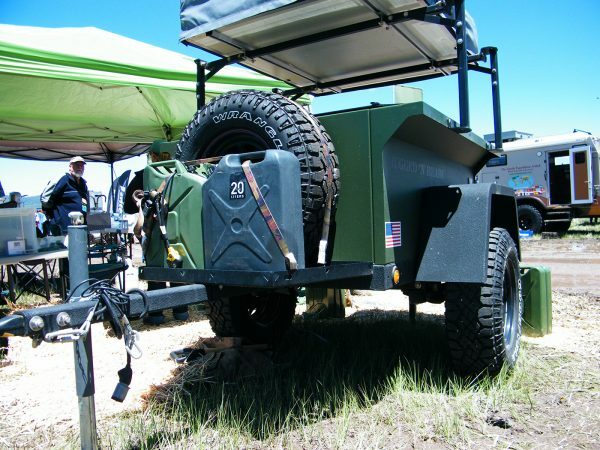 The Rugged ‘N Ready Backwoods Trailer, a heavy-duty off-road trailer that can be configured for overlanding. 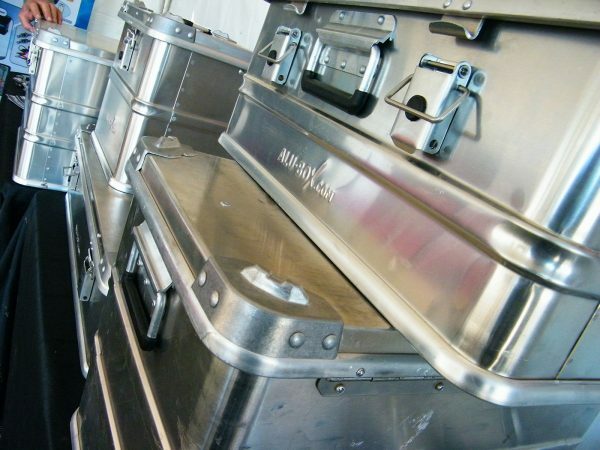 These Alu-Box cases are light, stackable, high-quality storage boxes. They’re sealed against water and dust though aren’t fully submergible. They can be drilled through and permanently mounted on vehicles. 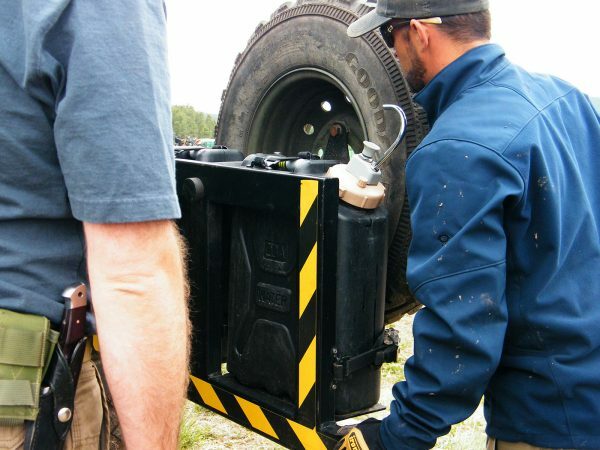 Here’s and interesting post on Expedition Portal in which they compare them Pelican cases. 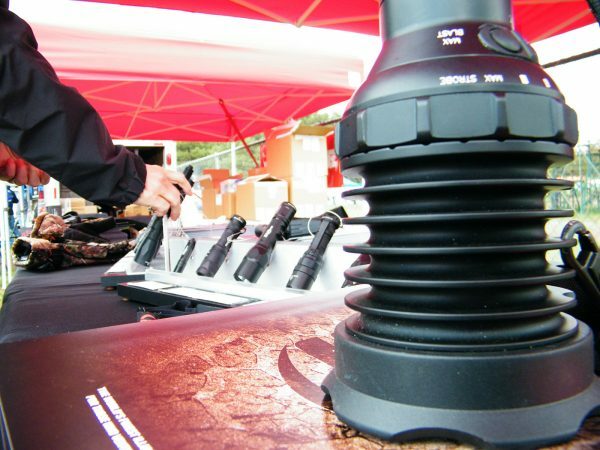 If you have a Hi-Lift jack with a neoprene cover, you know that eventually the neoprene will fade, degrade, and fall apart do to UV exposure. 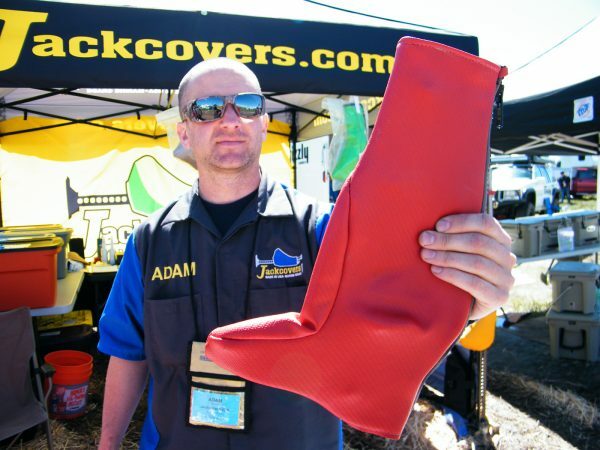 Well, this guy created a jack cover out of UV-stablized, marine grade vinyl so it will last for years. Here’s a link. 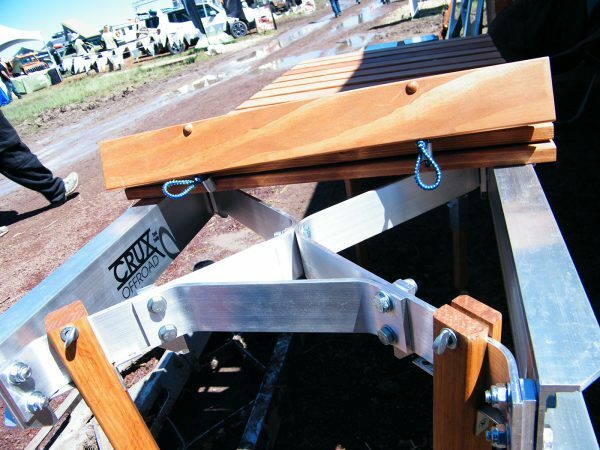 Crux Offload makes sand / bridging ladders that (when clean) can double as very nice camp furniture. 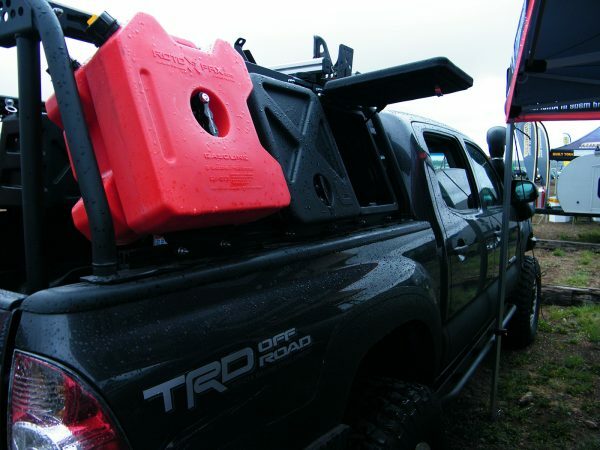 When on trail duty each bridging ladder is rated to hold 2,000 lbs, or 4,000 lbs per axle for a set of two. 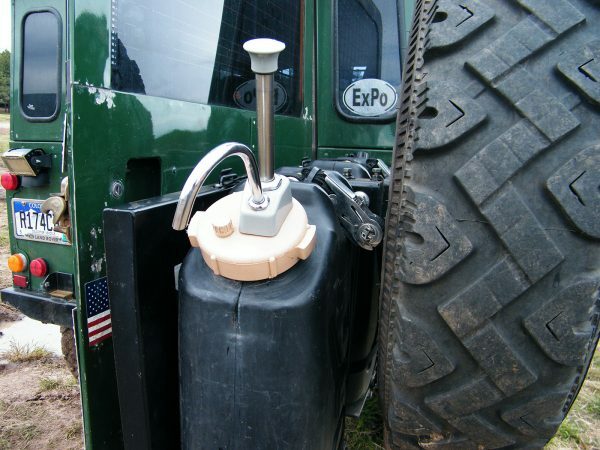 This a very clever DIY project is made with parts available from any RV supplier. 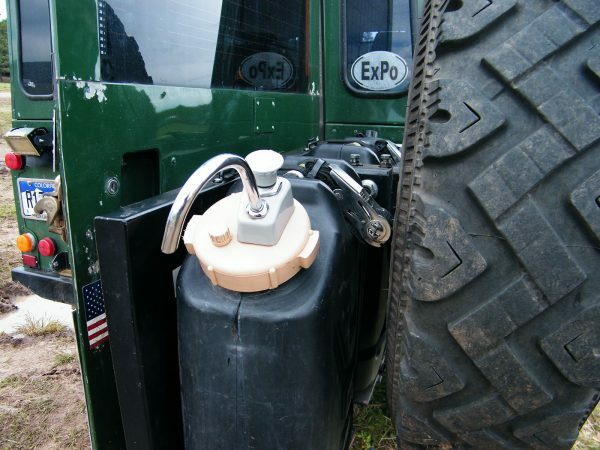 It enables you to pump water from your jerry can without having to move them from their mounted location. 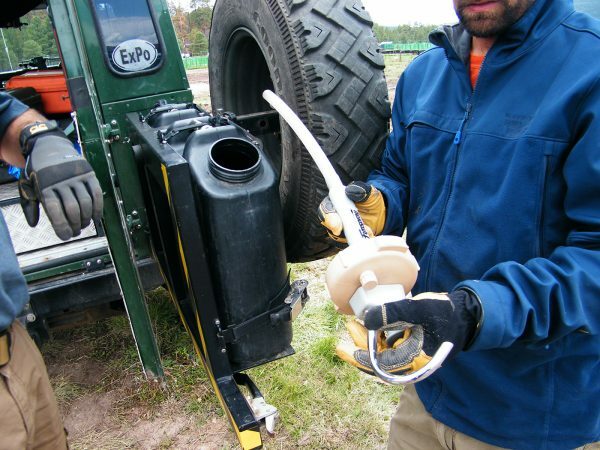 The spigot twists upwards to seal the can and downwards to open. Then just pump away. Here’s an Expo build thread on the topic. And one final tip. If you have a rooftop tent and have issues with condensation dripping from the ceiling, install a piece of fabric like this. The fabric reduces condensation and will absorb any water drops that do fall. 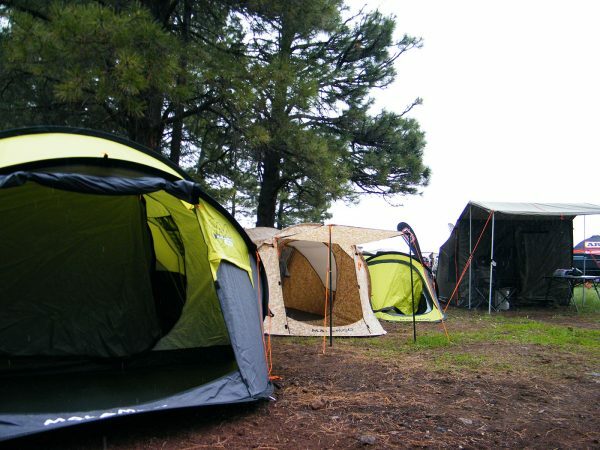 During the day, when the tent is ventilated, moisture escapes from the fabric back into the atmosphere. Brilliant!